Today we are interviewing ASJ McCormack, author of "The Ultimate Guide To Singing For A Living… All you need to get started with a career on the stage." I was born in 1978 in Douglas in The Isle of Man, where I spent my early childhood years. I now live in the beautiful city of Chester. My passion is predominantly singing, but I also love anything creative involving graphic design, photo/video editing and of course writing. I spent my early teens up to now entertaining the public, singing in venues across the UK and Ireland. I started out in the local pub & club scene and have gone from solo act to rock bands, duos to the tribute market. Oh and not forgetting a 16 piece commitments–esque soul band with brass & horn section! I lived and entertained out in Spain for 4 years, eventually leaving to have my family of two children, currently 3 and 5 years old now… The tribute scene is where I am at now, performing two tribute shows to Madonna and Lady Gaga. Before going into entertainment full time I worked in web design and IT systems for a large pharmaceutical company in Cheshire. I gave it all up to live the dream; I never was a morning person! 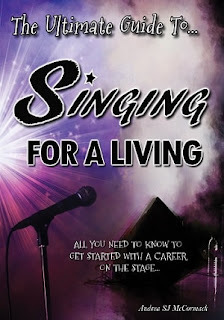 THIS BOOK IS FOR ANYONE WHO CAN SING AND DREAMS OF TURNING THEIR TALENT INTO THEIR CAREER AND ACTUALLY SING FOR A LIVING. This is not a how to sing book, it’s a 'what you do with it' now you know you can sing book! In this book I will provide you with the inspiration needed to take the next step to becoming a fabulous fully fledged performer in the competitive world of entertainment. - And a whole lot more of invaluable information! Anyone looking to become a working singer! If you love karaoke and are really good of course! and want to take it to the next level… Or you are always applying for talent shows such as the x factor or the voice. Anyone who dreams of making a living doing the thing they love and using their talents! 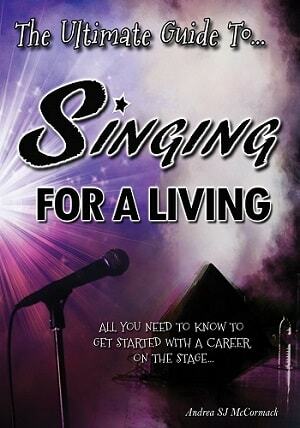 What inspired you to write a book about becoming a singer in the competitive world of entertainment? What do you think are some of the biggest mistakes aspiring performers make that keep them from reaching their dream of performing professionally? I think too many singers starting out take the wrong advice of others around them that either don’t know enough or know too much and try to mold them into something completely out of their own style that suited them originally. Some also get pushed into TV reality shows like the x-factor or the voice too early on and if they don’t get through they get their confidence crushed at that crucial time when they need to have 100% self-confidence. You have a section on persona and stage presence. How important is it for singers to develop this aspect of their art? How much time should singers allocate to researching the financial, legal, contractual aspects, etc of performing prior to pursuing it? Should all performers get an agent? Or is it possible to be successful without one? It is not a necessity at all to have an agent, you can do it yourself but you need to put the work in. The bigger venues will use agencies only and other venues so you have to talk your way in and know the right contacts for them to book you direct. With an agent they have the venues ready and waiting for acts on their books and they can fill your diary up for the year. The price for this service is the commissions you pay them after each gig. If you book direct with a venue the full profit is yours. You are also protected in a sense whilst working for a venue in case of any problems arising, so the more experienced you are the less likely you will need an agent as you will have the experience to deal with any issues. I work mostly from direct bookings now but still do the odd one for agents. I think potential acts will see it’s not as difficult as it is deemed to be to get started, to work for yourself in this business and at the same time they will see its more about the business behind the scenes that takes up the time more than the performances! You can spend hours on the motorway then time setting up your gig at the other end just to be singing for an hour and half that evening! People tend to think you just turn up, get paid, then go home… but there is so much more involved. My next writing project is my personal story called ‘becoming just a girl’. Just a Girl is my stage name. I started this one 20 years ago! I always kept diaries of my gigs and scrapbooks to go with it. I saved everything! It’s a tell all book of how I started singing from a child, my passion for smash hits magazines and all things pop, recording the top 40 on a tape recorder every Sunday, pretending I was Tina turner in the mirror singing into a hairbrush, headphones on! (I was at Wembley then, don’t you know!) while my parents were sleeping next door! It’s all my experiences on and off the road… Eurovision entry, giving up the day job, singing and living in Spain & later becoming almost famous! Almost! My book is everything you will not get told by other professionals or acts in the business… It’s written by someone who had to work everything out from scratch, from day one, with no help advice, contacts or otherwise… If you’re a singer this is the book I wish I had when I started out, I would of paid a small fortune for it haha!! !